Le Métier de Beauté In The Know Bordeaux and Purple Haze are finally available (more accurately, no longer backordered) on the Neiman Marcus website and I thought I should give those who own Framboise Crème a quick comparison, hopefully ending the "to buy or not to buy" dilemma. Those who don't, well, here are two excellent lip crèmes just waiting for you to agonize over! In The Know Bordeaux, as discussed, is the color du jour of this year's fall. You really cannot do wrong with this elegant cabernet hue. Framboise Crème, a neutral red infused with orange/gold shimmer, is part of Le Métier de Beauté's permanent lineup. In retrospect, there really isn't much to compare since both are entirely different colors. That said, while Framboise Crème seems to be the more timeless option, if I had to choose only one (for now) I'd go for In The Know Bordeaux, solely for its limited availability. In The Know Bordeaux and Framboise Crème both retail for $36. In The Know Bordeaux is exclusively available at Neiman Marcus and neimanmarcus.com, while Framboise Crème can be found at other Le Métier de Beauté counters (Nordstrom and Bergdorf's) as well. In The Know Bordeaux was sent to me for consideration by the company, while Framboise Crème was a gift with purchase. Good thing I don't have to choose only one! Thanks for the excellent as usual swatches. Speaking as someone who owns only LMdB lip glosses, what is the difference between them and the lip cremes? Hope you can help out. I hate you. 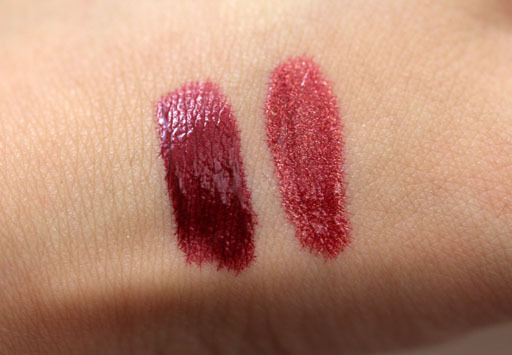 I've wanted lip cremes ever since you started showing their gorgeousness, and these two colors are no exception. I WANT Bordeaux so much! @lexi920 You're very welcome :) I hope you enjoy In The Know Bordeaux! @Leigh haha I'm glad I can answer that question. The Lip Cremes are much more pigmented compared to the Lip Brilliances. After all, the cremes are more like lipstick/gloss hybrids, whereas the glosses are just glosses. Also, the cremes are meant to be mixed together and layered while the glosses were just supposed to be toppings, if you will (though sometimes I cheat and play with mixing glosses with cremes). Personally I find the lip creme formula more "milky," if you know what I mean. I love both formulas. But Leigh, if you don't have a lip creme yet you HAVE TO go out and get one asap! I do not kid when I tell you that I haven't bought any new glosses since I began using my lip cremes. @Michelle perhaps the only time a person would smile hugely when told she is hated :P Life changers, these cremes are. Get one for yourself as a treat! Thanks for this comparison! I was torn between the two but ended up getting In the Know as that's LE. Now to just figure out if I need Chanel's Triomphal if I already have Bordeaux! Thanks for the detailed response. Actually, I don't think I've ever tried a "milky" lip formula which probably is a shameful state of affairs and one I will have to rectify promptly. Ellis Faas 201 is on its way to me from Sephora, incidentally! You must enjoy instilling temptation and being an enabler :p it seems to be a requirement for beauty bloggers! I might bite the bullet and buy one someday. It's just a matter of justifying the price and choosing a color (everyday or special occasion). I know this is late, but I really wish In the Know Bordeaux was permanent - If it was, I think it would be my go-to. I've seen all the shades, and haven't liked any of them, but I love this one. Its depth is perfect. 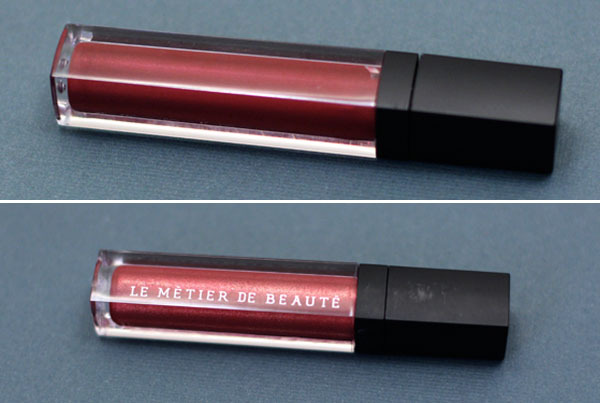 The other shade I really like by Le Metier de Beaute is Red my lips, and that's limited edition too!